This configuration allows 4th Axis Indexed and continuous roughing and finishing operations to be created. 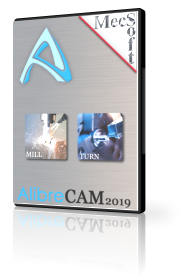 Curve based continuous machining such as 4 Axis Facing, Pocketing, Profiling & Engraving as well as Surface/solids based machining such as Roughing, Finishing and Curve Projection machining are available. This configuration includes all of the functionality included in the Standard (STD) configuration.